Are High End Memory Cards Really Worth It? What is the difference between a $20 SD card, and a $120 UHS-II or XQD card, and are the premium cards worth the extra money? I recently got an XQD card and a Sony Tough Card, a hardened UHS-II SD card, and here’s what I found. To test the cards I am using a D850, shooting full resolution 14-bit compressed RAW files in continuous high. I was shooting high ISO to make sure the shutter speed wasn’t slowing it down, and shot the stopwatch on an iPhone. I then took the first 50 shots from each series, and compiled the times (a few times are estimates since the numbers are changing in the image). The running average is based on the current and previous 2 times. I did not test exporting to my computer since it seemed to be limited by the speed of my external disk as much as anything. D850, 24mm PC-E, Platypod MAX, 3 Legged Thing ballhead. Processing in Luminar. 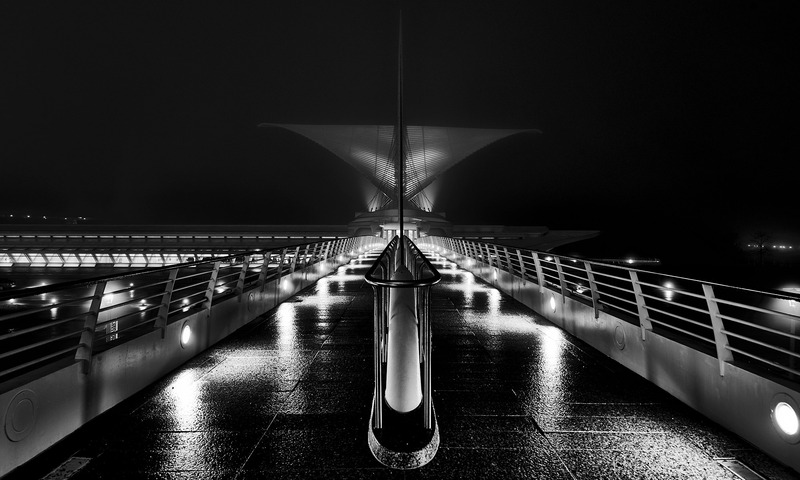 Like almost anyone in Milwaukee, I love shooting at the Milwaukee Art Museum. We have a family membership, so I have more opportunities to shoot inside, too. My son and I went last week, and I set up on my Platypod MAX with a 24mm PC-E tilt/shift. The Platypod is great for getting super-low angle shots like this. I had envisioned the blurred people, so I was shooting with a 6-stop ND filter, about .7 seconds. The Final. Processing in Capture One Pro 12. This building is the gift that keeps giving. What are your go-to places to photograph? Leave it in the comments. One of the features of the Mavic 2 Zoom is the Super Res mode. Super Res creates a multi-row panorama that starts at the wide end of the zoom range to compose, and when you hit the shutter button it zooms in and takes 12 images, stitching them into a panorama that covers the original field of view. I have not used that much, since it creates a JPEG rather than a RAW file, which among other problems loses too much dynamic range. Unfortunately due to the nature of RAW, it is not really possible to save a panorama in RAW. RAW takes the data directly from the sensor and writes it to a file, and that only really works with one image. In DJI Go 4, select Camera Settings > General camera Settings > Turn on “Save original panorama”, and then select RAW. With this I am able to get access to the full dynamic range of the camera, and really high resolution. Import the images into Capture One (or your favorite editor), and edit one of the images. I usually pick either the image with the most of the main subject in it, or the most contrast to set black and white points. Once you are happy with this, copy the adjustments to the remaining images. Double check them all to make sure the adjustments look alright across all the images. If any further adjustments need to be made, they need to be copied to all the images. I export the images as 16-bit TIFFs, which stores the most data, and gives the final panorama almost RAW-like editing options, but take up more space, so you may want to remove them after the panorama is stitched. For stitching, I usually start with Photoshop, which is very good about 80% of the time, and pretty much useless in the other 20%. So far the Super Res panoramas stitch well in Photoshop. Once the stitch is done and you are happy with it, crop the image, flatten the it, and do any final color and exposure adjustments in Adobe Camera RAW. The final images that I created were around 62 megapixel, since you an get a little more around the edges than the default stitching in-camera. Having the ability to create high resolution images with reasonable dynamic range in RAW format really adds to the flexibility and value of the Mavic 2 Zoom. Do you want to make money flying your drone? If you want to fly a drone in the US for anything other than as a hobbyist, you need to get licensed under 14 CFR Part 107. To get the license, you need to take a knowledge test from the FAA. A couple weeks ago I passed the Part 107 knowledge test with a score of 95%. Here are my thoughts on the test and the processes to get it. I had a little bit of a head start, since I started studying for a private pilot’s license a few years ago. Although I decided not to get it at the time, it meant that a lot of the FAA stuff was already familiar. I wasn‘t ready to test on it, but I already had the basic concepts of airspace, airport procedures, aerodynamics, etc. One of the benefits this had was understanding the “why” on some of the things that don’t seem to make as much sense if you are only familiar with flying drones. Why do you need 3 statute mile visibility when you can’t see a drone at that range? Why the 500 ft below, 2000 ft lateral cloud clearance? Because those are the VFR (visual flight rules) limits for manned aircraft (and you can see manned aircraft at those ranges to avoid them). It makes sense to keep that consistent, especially so manned aircraft pilots know what to expect. Knowing how to read TAF and METAR weather reports are useful because they include aviation specific details like visibility and cloud heights. Your weather app probably doesn’t provide those details like the reports that are designed for pilots, even if those reports could use an update. The ASA test prep app. A copy of the testing supplement, which is how you are provided the sectional charts, weather reports, and other material during the test. It is a good idea to go through the testing supplement and make sure you are familiar with all the codes in the METARs, look through the sectionals, etc. since this material is more likely to show up on the test. It is available in hardcopy from Amazon with the ASA Study Guide (Amazon affiliate link) or as a PDF from the FAA. I worked through all of those a few times, and had a pretty good grasp on the topics. I also had The Airplane Flying Handbook and Pilot’s Handbook of Aeronautical Knowledge as reference, but only used those to look up a couple details. The FAA makes some of the actual test questions available, and all of those resources use them. I had many questions on the test that I had seen verbatim in the practice tests, or with slight differences. Just remember that there might be variations in the questions and answers, so it is not enough to just memorize the specific answers, but having the questions is a very solid blueprint of what you need to know. Once you are comfortable with the material, you need to call PSI at 1-800-211-2754 to schedule the test. They can provide you the nearest testing center, but it would be best to look at the FAA’s list of testing centers so that you know which one you want to use. You will need to provide a credit/debit card to pay the $150 testing fee. The first time I called I got stuck in queue for a while, then told to leave a voicemail. I ended up having to call back again, at which point I got through to an agent. Other than the wait the scheduling process was fairly painless. When you get to the testing center you should be shown to a computer that will have at least a few sheets of paper and a pen or pencil for notes and calculations, and the FAA Testing Supplement. There may be a calculator and some other items (like an E6B) that are more helpful for traditional pilots. Any questions that refer to a figure are referring to the testing supplement. Be aware that the page numbers and the figure numbers that are referenced in the question are a few off, and I found myself looking at page numbers instead of figure numbers a few times, which can burn some valuable time. The test shows numbers for all the questions down the left, color and symbol coded for answered, unanswered, and marked, as well as a few variations. You are allowed to mark questions for review, or review any/all by clicking them on the left or using the forward/back buttons. My practice if marking is available is to always take a best guess at the answer, since if you run out of time you have a 33% or better chance of being right, instead of 0% if you don’t put in some answer, and if I am at all uncertain mark it to review. I ended up marking about a third of the questions, although I only changed a couple on review. The exception is that if one is really a guess I usually don‘t mark it for review, since it is likely to just waste time. Any questions that have to do with the sectional charts it is worth referring to the chart legend in the testing supplement, since that gives you a lot of the answers to those questions. I have seen some complaints about the questions, but in comparison to some IT certification tests I have taken, I thought they were alright. They also give you the option to go back and review the questions that you got wrong after the test, although it only shows the question, not even the options for the answers. Two of the three I missed were chart questions, and there was some doubt when I answered them exactly what area the question referred to, so I don’t feel too bad about those. If you pass the test they give you your score, and instructions for registering on the IACRA (Integrated Airman Certification and Rating Application) site. There is no additional cost for this part, but you need to do this to actually get the license. It takes about 24-48 hours for the test to post to IACRA, you finish the application, and then wait. In a few days you should get a temporary license you can print, and several weeks later you are assigned a certificate number, and a permanent card printed. You can do anything with the temporary certificate that you can with the permanent one (flying wise, anyways using it to scrape anything probably won’t work…) just use “pending” instead of your certificate number for waiver applications or anywhere else you need it. The card took several weeks to get processed, printed and mailed. All in all it was a reasonable test for something like this, and should not be a problem for most people if they put in the time to study for it. Earlier this year my wife an I spent about ten days in the UK, including driving, which can be a little intimidating for people used to the road laws from another country and driving on the “other” side of the road. As an American driving in the UK, I was careful not to say they drive on the wrong side of the road. But I will say that we undeniably drive on the right side of the road, and I’ll let you work it out from there. While the information here is correct to the best of my knowledge, please refer to the linked sites with the corresponding regulations to make sure it is still accurate or to clarify anything that is unclear. Feel free to leave any questions or corrections in the comments. The most obvious difference is that in the UK they drive on the left, and the driver sits on the right in the car. You may find some left hand drive cars, but if you rent in Britain you will get a right hand drive car. It wasn’t as big a deal as I thought it might be, but you need to pay a little extra attention, especially at turns. The more disconcerting thing is passing on the right instead of the left on the motorway. When renting a car, remember that through most of Europe the standard is a manual transmission, so if you can’t drive manual, make sure you request an automatic. In Britain you might want to anyways, since the shifter will be on the opposite side if you are used to left hand drive cars. I had no problem just presenting my US driver’s license to the rental company. You can drive on a US license for up to a year, if you are staying longer you need to get a UK driver’s license. For more details check out the uk.gov site. If you have a driver’s license in a non-English language you should get an international driving permit before driving in the UK. The rental experience was a little different than the US, they were much more polite and hands on, making sure everything was OK, walking us around the car, etc., the flip side being that the whole experience was slower. Don’t know which I prefer, but there is is. The roads in Great Britain can be a lot narrower than you are used to. We found ourselves on a lot of single lane roads, with only periodic places where cars could pass, and even on some of the larger roads there were frequent narrow spots where there wasn’t a center line. The normal rules are that a car going down a hill should give way to a car coming up. In my experience it was more like a fairly polite free for all. If it is easier for you to pull over, do it. If there is a passing place on the right, stop opposite it so that the oncoming vehicle can pass, and be prepared to back up to a passing point if needed. The roads are divided into Motorways, which start with an M, such as the M25 around London, and A, B, and sometimes C roads. A Roads are named A and a number, like the A39 along the west coast of Cornwall. A Roads are generally bigger than B Roads, which are bigger than C roads (C Roads are often not marked with a number, and are only known by their road number for administrative purposes) Because most of the roads numbers were designated decades ago, this is not always true. For instance, a B Road may have become much larger than it originally was, and they were never renamed, making it larger than some A Roads. Speed limits were one of the biggest problems I had, as I had not gotten acquainted with the national speed limits before driving. If you are driving a car and not towing anything, the national speed limits are 30MPH in built up areas, 60MPH on single carriageways, 70MPH on dual carriageways (divided highways in the US) and motorways. Any deviations have signs posted, with a number in a red circle indicating the maximum speed in miles per hour. Where the speed returns to the national speed limit there is a sign that is a black slash through a white circle. Why they can’t just post the speed limit I don’t know, but there it is. The other thing you might see is variable speed limit signs, which are then accompanied by lighted speed limit signs indicating the current speed limit. If the signs are not illuminated, the national speed limit applies. There is a generally applied 10% + 2 MPH over the speed limit allowed, but don’t count on it. Everything I have seen is that it is a guideline that the police often use, but is discretionary, not codified anywhere. You can be fined for even one MPH over the limit. Road signs are pretty intuitive, but you should probably look through the road sign list on gov.uk. One that might be confusing is that a circular sign with a red outer circle means “don’t do X,” even without a slash through it. Average speed cameras measure the time between passing two cameras, and calculating your average speed. This means that even if you slow down for both, they can still nick you for speeding. You can be fined for touching your phone while in the car with the engine running. Including being parked, paying with your phone at a drive through, adjusting GPS, etc. The same applies to messing with GPSs, etc. Just don’t. We visited London at the end of the trip, dropping our car back at Heathrow, and taking the tube to our hotel. That worked well, and is what I am planning to do for any future visits. What Are Optical Brightening Agents (OBAs)? As you shop for photo paper, or look at my Paper Finder, you may run into papers claiming to be OBA free, or low OBA. What are OBAs, and why would you want to be free of them (or not)? OBAs are Optical Brightening Agents, also known as Optical Brighteners, Ultraviolet brighteners, or artificial whiteners. When hit with ultraviolet light, they fluoresce, emitting a blueish light that makes the paper look brighter and whiter. Brighter and whiter are two things we want from our paper, so what’s the problem? The main problem is that the OBAs degrade over time, becoming less effective. This makes the paper look less bright over time, and since the light that the OBA emit has a bluish tint, the apparent color can shift as the OBAs degrade. If you are unsure of the OBA content of a specific paper, looking at it under a blacklight is the fastest way to check. Papers with OBAs will glow a bright bluish white, while OBA-free papers look a dull purple or pink. Three different papers under a blacklight, Left to right: Canon Pro Luster, (High OBA), Red River San Gabriel Baryta 2.0 (“Low” OBA), and Breathing Color Signa Smooth 270, an OBA free fine art paper. The same papers under normal light. So, should you always avoid OBAs? Probably not. With normal prints the trade off is probably worth it to get the bright white that we expect with a photo paper. Most “photo” papers contain OBAs, so other than a few high-end baryta papers you are going to have OBAs if you want a classic photo look. Photos in an album are probably not going to degrade enough to notice, photos that are properly displayed under glass should look good for many years, and photos displayed in less than ideal conditions can be reprinted in the future. Even fine art prints on archival papers need to be displayed correctly to get the full archival benefits of the materials used. I have also seen it recommended to display prints under UV blocking glass, since it is the UV light that not only fluoresces the OBAs, but also degrades them. Based on my understanding it seems like this would just make the print look like the OBAs had burned out, since no UV light will fluoresce them. If you are looking for archival permanence, you are probably better off starting OBA free, but if you have a print you want to protect this is probably the best way. Incidentally, even OBA free prints will last longer displayed under UV glass. In fine art prints, longevity is of paramount importance. This is especially true with limited edition prints, where the photographer commits to only print a certain number of prints, so reprinting is not an option. In the case of selling prints, the buyer should also be considered. Fine Art buyers frequently know exactly what they want, and may demand OBA-free papers. On the other end, people buying postcards or greeting cards may want a photo look, and not expect archival permanence. Test some different papers (Amazon list, affiliate link), and see what results you like, or check out my paper finder, where you can filter based on OBA content. Designed by Fitzhug Scott-Architects, Inc. of Milwaukee and Skidmore, Owings & Merrill of Chicago, and completed in 1973, the four story MGIC headquarters building is constructed in a unique inverted pyramid design, with each floor extending fifteen feet out from the floor beneath. It is one of several buildings on the MGIC Plaza overlooking Red Arrow park in downtown Milwaukee. This photograph was a single ten second exposure, taken on a Nikon D850 at ISO 100, 24mm PC-E tilt shift lens at f/8, and processed in Capture One Pro 11 and Adobe Photoshop (removed a security camera near the roof). Using the color editor in Capture One I was able to tone down the yellow cast in the building from the lights. Annunciation Greek Orthodox Church in Wauwatosa, WI. Annunciation Greek Orthodox Church in Wauwatosa, WI. The church was designed by Wright in 1956, and finished in 1961, about two years after Wright’s death. While departing from the traditional Byzantine architecture common in Greek Orthodox churches, Wright incorporated the domed structure and traditional colors into his design. More information about the church is available on their website, http://www.annunciationwi.org/. This photograph was taken well into nautical twilight, about 45 minutes after the sun set. It was taken with a Nikon D850 at ISO 100, a 24mm PC-E lens at f/5.6, on a 3 Legged Thing Winston tripod. It is 3 exposures, 1.6, 6, and 25 seconds, and processed with Aurora HDR 2018. Few things are scarier to the average photographer than the idea of cleaning your own DSLR sensor, but if you are careful it is not difficult to do safely and successfully. That said, it is possible to damage your camera, so be slow and careful, and I am not responsible for any damage that you do to your equipment. Read any instructions on cleaning supplies and tools, and follow them over this post. Sensors need to be cleaned when dust, oil, or other residue is left on in. It is natural for this to occur, and needing to clean the sensor occasionally should not be considered a malfunction. Junk on your sensor is most visible against even backgrounds, like a blue sky, and at higher apertures, although in some cases it will be visible even against busier backgrounds. A sensor that needs a cleaning. If you see dust spots on your images, it is time to clean your sensor. If you can see the spots in your viewfinder, the problem isn’t in your sensor, it is ether in the viewfinder or the lens.